The Vegetable Garden project for CF is nearly complete. To ensure a bountiful crop MB advised that plenty of manure and blood & bone is necessary, so MDR put out some feelers and was told by an equestrienne colleague where he could find some free horse manure. MB & MDR called in today and filled up the ute. Surprisingly enough the horse manure didn't smell at all, resembling more a mound of dry compost. Luckily this was so as the wind was very strong and blowing "manure dust" over the pair. 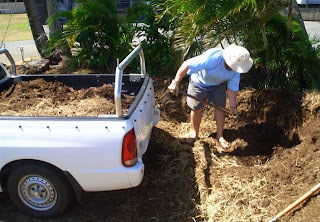 Will be unloading the manure later today into the custom built vegie garden enclosure. The topsoil will be delivered tomorrow (Labour day public holiday) from Limberlost and seedlings can then be planted. You didn't say what you will plant? You'll have to let us know.